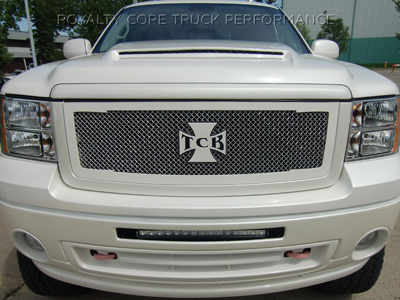 Customize Your Truck With A Royalty Core Grille. All Royalty Core Grilles are constructed with military-grade, corrosion-resistant stainless steel and come with a lifetime warranty. First, choose your Royalty Core grille design. Mesh Size: Choose between 5.0 Super Mesh, 10.0 Power Mesh, or 12.0 Sport Mesh. Emblem: Royalty Core emblems offer the ultimate unique touch to your grille. Choose one of our designs or create your own. Each emblem is handmade with precision and can be created in a single color or two-tone. Logo: Royalty Core can create an emblem with your design or logo. All of our emblems can be removed and replaced when you’re ready for something new. Color & Finish: Most of our designs offer a choice of black, chrome, or a custom color to complement your truck. You can even choose one color for the grille frame and another for the mesh. Royalty Core also offers satin or glossy finishes. Accent Studs: These triple-chrome plated stainless studs are resilient, corrosion resistant, and provide the final touch to your unique grille design. You choose the color and finish on the studs, too. Integrated LED lights: Royalty Core offers several grilles with integrated LED options. Are you ready to build your grille? Start here.